We recently made a weekend trip to Pittsburgh, Pennsylvania to visit a friend and found out that the city was home to the Andy Warhol Museum! It easily became one of our most favorite museums. Containing the largest collection of Warhol art— it’s seven floors featured not only screen prints, but paintings, videos, illustrations, and electronic pieces that Warhol produced in different stages of his life. It even has “The Factory” where you can screen print your own pieces to take home! 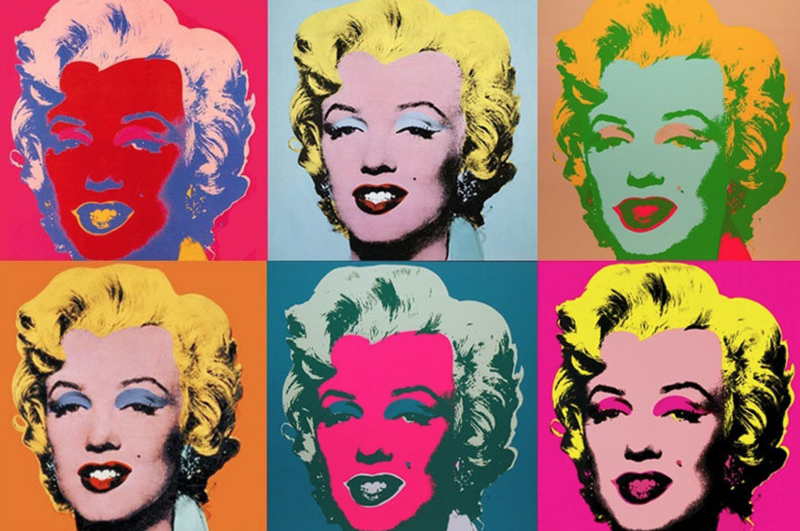 Andy Warhol leveraged his aesthetic with the subject matter of celebrities, their lives, and pop culture. This is seen in the museum’s numerous Warhol portraits. As I wandered the floors, it was the larger-than-life-sized brightly-colored heads that made lasting impressions. They were often in pairs and featured pop culture icons such as Marilyn Monroe, Elizabeth Taylor, and Mao Zedong. At times, it felt like a room of TV screens— a density of commercial aesthetic embracing mass production and the plurality of our love for pop icons. I found it all so easily consumable, instagramable, selfie-worthy in many ways. I guess pop art is still pop art! I found it interesting to ruminate about pop art and art’s role in a world of social injustices and disparities. When I looked at his art, was I moved? Was I changed? Was I challenged in my beliefs? I am not sure, but in any case, his motifs persist to our modern era today, which is laudable. 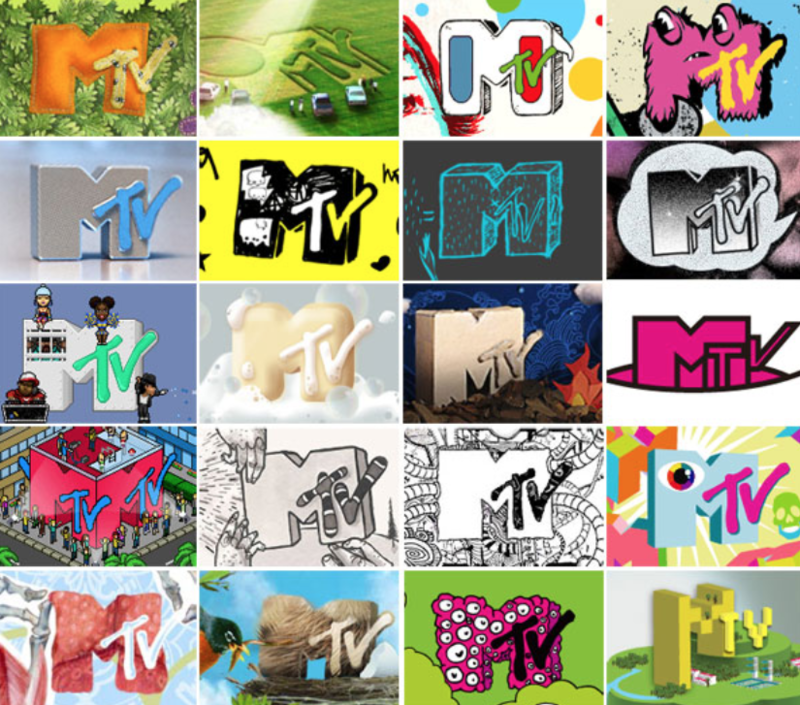 Look at how Pandora has remodeled it’s branding, iterating from MTV’s iconology. His most famous portrait is of “Shot Marilyn” (iteration at the top of this page). Looking at the branding and advertisements of today and comparing them to his portraits— it’s easy to see how Warhol’s paintings left such a titanic mark in our modern aesthetic. When we went back home to Rhode Island, inspiration continued to seep in me. 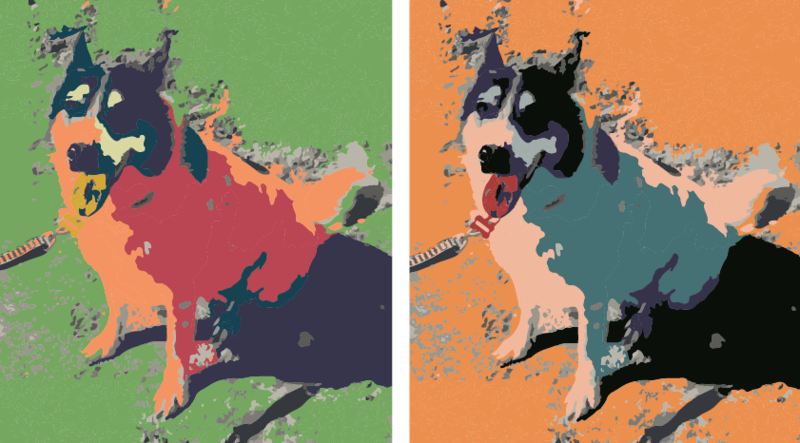 I really needed to make a wedding gift for my cousin, and naturally, decided to Warhol-style-paint something important to them— their dog, Mishka (she had Mishka as one of her bridesmaids!). If you have intermediate Adobe Illustrator knowledge and some painting skills, you can create a Warhol portrait yourself! First, get a fairly good photo of your subject and then tweak it in Adobe Photoshop: increase the contrast, simplify the colors used, and increase the sharpness. 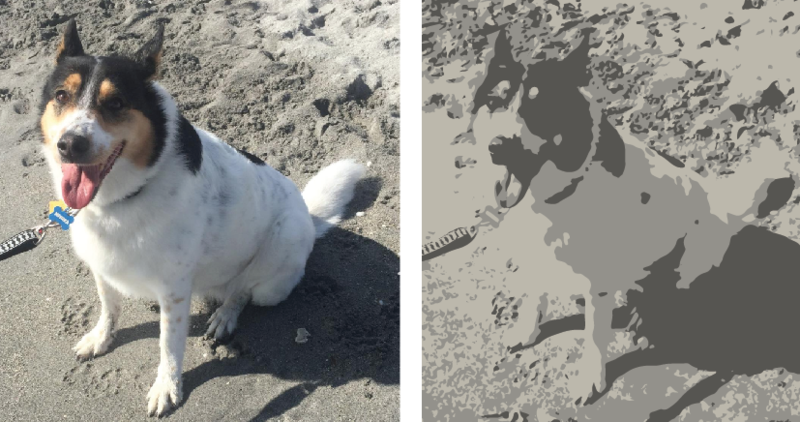 These steps will help optimize the next step in which we will use Illustrator to “vectorize” or “image trace” the photo into faux-screen print style. Take a photo. Ideally, optimize it in Photoshop. Then use Illustrator to “Image Trace” it into a limited amount of colors. Play around with the settings: you may have to choose the number of colors allowed, threshold, path options etc. For the second step, you have vectorize the image and then choose the colors you want to paint with. Vectorize the image with “live trace.” Afterwards, I found it useful to “expand” and then “ungroup” the live traced image. This will help you select only certain vectors of certain fill colors. Select a vector shape and use the top menu “Select > Same > Fill Color” to select the same vector shapes with the same color. Now with all the vector shapes of the same color selected, you can “group” them together and then change them to another color. I ended up with these color selections (I am no genius and basically looked at a bunch of Andy Warhol paintings for help). After live tracing the photo, I selected vector shapes of the same fill color, and mixed and matched colors to my liking. Obviously, you’ll need intermediate knowledge of Illustrator and Photoshop and painting skills to do this project. There’s a lot of info online if you need a more precise tutorial— I included some links for these below. One Response to "How to Make an Andy Warhol Portrait Painting"